• Rørtykkelse på bro: 16mm. Perfekt til ophængning af lys, bag- og stjerne- tæpper for mobildiscoteker, bands, m.v. This set is an ideal solution for mobile DJ's, compact rentals as well as musicians. It comes complete with two stands and three pieces of metal mini-truss. Each truss is 2 meter long and can be easily connected by quick-connectors. The total width of the set is 6 meter. The minimum size of the stands is 170 cm and the maximum height is 3 meter. 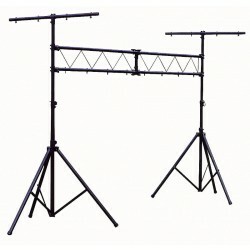 The set comes ready to use, including stands, trusses, truss support and quick connectors.